I still haven't been able to convince myself to purchase the Veneer font, as much as I love it, so I appease myself with my ongoing search for fun fonts that just may come in handy one day. I did get the Veneer Extras though, since they are free. These are some of the latest that I've found, though they are by no means new, just new to me. Blackout by The League of Moveable Type comes in 3 styles and I suspect it would be a good font for those that have a Cameo. 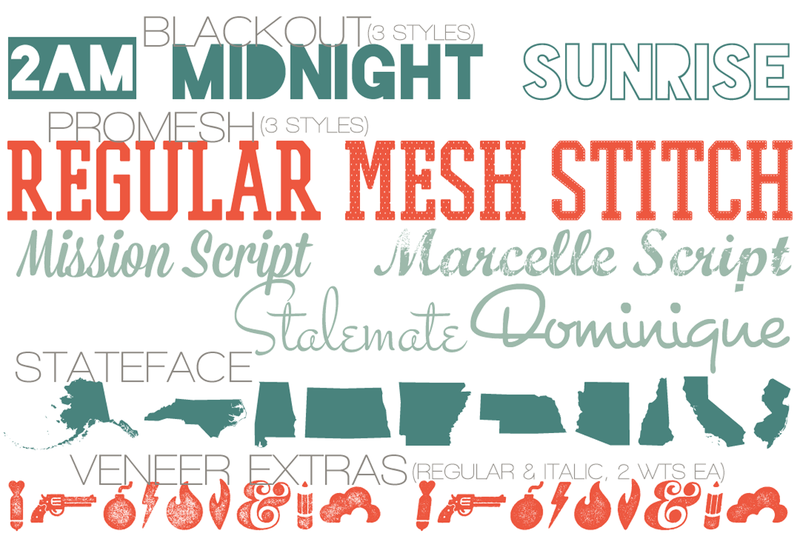 I found PROMESH when I was looking for fonts for my football printables and also comes in 3 styles. I like the retro look that Stalemate provides and think it will work well paired with a modern sans serif font. I've been a long time stalker of the work shared on Deviant Art, and have gotten many brushes for Photoshop there, but Dominique was the first font I've found that I really liked. Mission Script* and Marcelle Script aren't new to my collection, but I wanted to share in case you hadn't seen them before. I downloaded Stateface a little while ago because I had a project in mind, but that has yet to come to fruition. If you have any fonts that you love, let me know, I'm always on the lookout! Oooh love these fonts, TFS!!! There are some fun ones here! TFS! These look nice! Especially Dominique :) TFS!! Those are some really cool fonts! My favorite that I use all of the time now is My Underwood.